Wendy and Chris visited our store from Crater Lake where both work at the park: he as a cartographer and her as liaison to visiting research scientists. 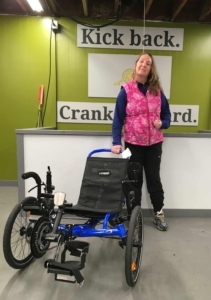 Wendy has been a dedicated trike rider since her 2001 stroke, so when time was up on her beloved Triumf Delta, she and Chris headed up to RecumbentPDX for its replacement. Wendy’s new ride is an electric blue Catrike Villager with control for braking and shifting moved to her dominant (right) side. The weighted heel support pedals keeps her feet properly positioned during crank strokes. The assist arms ease mounting and dismounting -we moved the mirror to the left arm to give her even more rearward visibility.